If x-rays were taken, we’ll show you what we found. On your second visit you will again sign in at the front desk and will then be brought back to either Dr. Jamie or Dr. Aaron’s treatment room. There you will be presented with your report of findings. This includes a summary of your exam and x-ray findings and also a recommendation for treatment. work to accompany that adjustment. 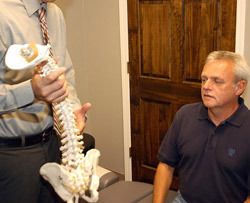 If this is your first adjustment, we will explain what you can expect. Just like your first visit you will then go to the therapy room where you will lay on the traction table and get electrical stimulation therapy. After your therapy is finished, our staff will bring you to the front desk where you will again check out and schedule your following visit. You should allow approximately thirty minutes for your second visit. Don’t wait! Contact Synergy Chiropractic today to get started with care.